I’m back home after a long week attending and presenting at the SQL PASS 2012 Summit in Seattle. This was the best event yet, in my opinion, and for me it was certainly the busiest. For the second year in a row, our SSIS Design Patterns team was invited to deliver a full-day preconference seminar before the Summit. Unlike last year, though, this year we have all five members of the author team! I also delivered two regular sessions: one on using DQS in the enterprise, and the other on how to handle errors and data anomalies in SSIS. Saturday started off for me in Portland, Oregon, where I spoke at SQL Saturday #172. I left that event just after the closing remarks and raffle (where I won a Kindle Fire HD – thanks Confio!) with Russ Loski and Karla Landrum to make the 3-hour drive from Portland to Seattle. We rolled in late, maybe 10:30pm or so, and Twitter didn’t find much going on so I popped into Elephant and Castle for a snack while I reviewed my slide deck for Monday’s precon. My first #sqlfamily sighting in Seattle was none other than my good friend Andy Leonard, and shortly thereafter I met up with Michelle Ufford at breakfast. After breakfast, Andy, Michelle, Matt Masson, Jessica Moss and I met up at the convention center to rehearse our material for the precon the following day. Had a great day of prep work, minor revisions, and a good deal of laughter. Later, I stopped by the registration area and officially checked in, and greeted a lot of familiar faces. About 20 of us got together for dinner at Cheesecake Factory, followed by a brief visit to the Tap House. Since the next day would involve an early wake-up call, I retired by 9:30 to give my material one last glance. I met up with Andy for a quick breakfast before getting wired up for our precon presentation. We kicked off at 0830 with a crowd of about 110 or so. It was fun to see a couple of folks in the audience who were also at our precon last year (shout out to Bill Fellows and Aaron Lowe). We quickly found a good cadence of trading off between the five of us presenting, each person leading the discussion for about 75 minutes. I shared design patterns around error handling, scripting, and data warehousing. It was fun to interact with the audience (along with others not in attendance) via Twitter throughout the entire day, through which we were able to share links to supplemental information about the current topic as the day went along. And on the topic of Twitter, my friend Andy offered me a valuable lesson about leaving my computer unlocked (and I shall have my revenge when you least expect it, good sir). 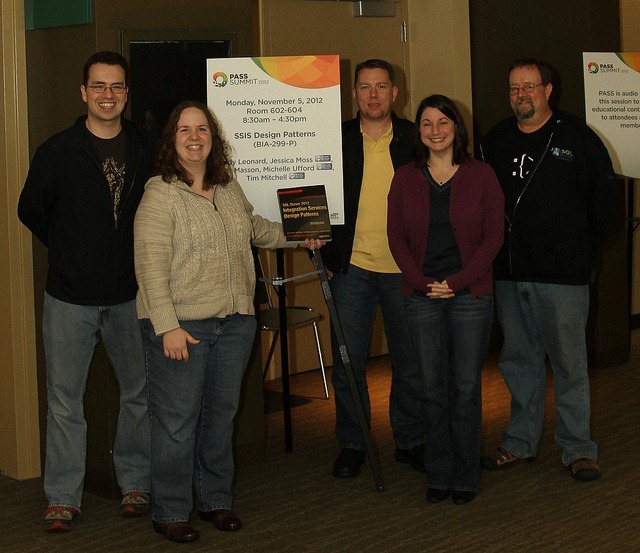 On Tuesday, I got to spend the day hanging out with a bunch of my favorite folks talking about SQL Server. What could be better? Later, I went by the PASS volunteer appreciation event to shake a few hands, followed by an after-hours trip to that karaoke favorite, Bush Garden. I stopped by the keynote for a bit to listen to Bill Graziano’s opening remarks. I stepped out to meet my friend Steve Jones for coffee, and ended up meeting up with about a dozen other folks as we chatted. I caught up with a couple of my Artis Consulting colleagues, and was off to take part in a book signing at the PASS bookstore. We got to chat with a few dozen folks (and managed to sell out all of the copies of our book at the bookstore!) in the hour or so we were there. I sat in on the session by Matthew Roche and Matt Masson on enterprise information management (EIM). I was particularly interested in the DQS portion of the presentation, and I was glad to learn a couple of new things about the product. Later, I stopped by the SQL Clinic to say hello to some of the folks from Microsoft. The vendor reception followed next door, where I did a little more networking and perhaps even some recruiting. Wednesday was also #sqlkaraoke day, with not one but two sponsored karaoke events: First up was the Pragmatic Works/Microsoft/HP event at the Hard Rock. These sponsors rented out the Hard Rock for some live band karaoke. Yep – a real band, not just canned tracks! This event was a ton of fun. I didn’t count, but there must have been at least 600 people there. I even got to belt out some Garth Brooks. Later I went out to the second sponsored karaoke event, at our favorite little hole in the wall Bush Gardens. It was a much lighter crowd there, maybe 75 people or so – enough to make it fun to socialize but still giving everyone who wanted to sing the opportunity to do so. Since I was presenting on Thursday, I spent the morning going through my presentation materials again. I delivered my DQS session after lunch, to a crowd of about 40-50 people. Good discussion around the different moving parts of the product, though I was surprised that of the entire room, only one person was actually using DQS. There were a couple of folks from the product team in my session, which I appreciated because I misspoke on the technical behavior of one of the elements of DQS, and they were able to set the record straight so I didn’t send folks off with the wrong message. For the final session of the day, I sat in on the BI Power Hour. This was easily the most entertaining session I attended. Presented by a host of Microsoft rockstars, this 90 minute session offered a fun look at some uses of the Microsoft BI stack, PowerPivot, and related tools. They had a standing-room-only crowd, and although their presentations were intended to be a little silly, I think they did a good job of showing some unconventional uses of those tools. After the last session, I went to the Friends of Red Gate dinner at Fare Start restaurant. This was the second year in a row that Red Gate has held the dinner at this location, which is a nonprofit training and placement organization aimed at homeless or otherwise disadvantaged individuals. The food was outstanding and the company even better. Later I stopped by the EMP Museum for the community appreciation event. Since karaoke has been the theme of evening events, there was another live band karaoke for this fiesta as well. I stayed for just a bit since I wanted to retire early and rehearse my demos again for Friday’s morning presentation. Back in the room by 11pm or so, I rehearsed until about 1am until I completely ran out of fuel. It’s time to talk about SSIS! I’ve been working on my error handling presentation for quite a while, so I’ve really been looking forward to this. I was a little concerned since it was a Friday morning after an apparently late night (at least according to the Twitter stream), and my presentation was scheduled for the same time as one given by the wildly popular Dr. David Dewitt. However, I was pleasantly surprised by a roomful of folks ready to hear about SSIS error handling: the room monitor counted 177 people in attendance. Lots of great questions and discussion both during and after the presentation – in fact, I was there for over 30 minutes after the presentation just chatting and answering questions. At lunchtime, I wandered down to the market to take a few pictures and watch them throw the fish around. In the afternoon I took in a couple of sessions, one on DQS and another on slowly changing dimensions. I skipped the last session of the day to stop into the PASS Community Zone, a very cool concept that just wasn’t very well publicized. I had a craving for some fresh seafood, so I invited folks down to the Crab Pot for some crustaceans. We had maybe 20 people altogether, though we did get split up since there was an early group and a late group. 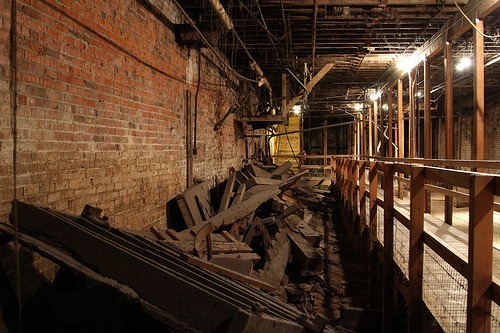 After dinner, several of us went on the Seattle underground tour, a 75-minute walking tour of some of the basements and underground walkways beneath Seattle’s city streets. Thanks to my friend Dave Stein for hooking us up with this! It was a lot of fun and a good way to wind down. After the tour, a few of us headed over for one last trip to Bush Garden, where 30 or so SQL folks were already gathered. I stayed for an hour or so, but fatigue got the best of me so I cabbed it back over (thanks to Randy Knight for taking care of our ride) and called it a night before midnight. Travel day for me. I headed over to the rail station early, only to be greeted by a locked door with a message that the train didn’t start running until 0830 on Saturdays. As it turned out, I was at the monorail station when I should have instead gone across the street to the Link light rail station. Inattention cost me about 30 minutes of standing in the cold, but on the upside, I met up with Ryan Adams and Michael Swart and got to chat with them on the 40 minute ride back to the airport. Ryan, Adam Saxton, and I ended up on the same flight back home, so we got to chat while we waited for our bird. One final parting gift was that my checked bag didn’t arrive on my flight. The man at the AA lost luggage counter was very helpful, tracking my back to a later flight and arranging delivery to my home for later that evening (it arrived about 11pm). Oddly enough, for as much as I’ve traveled, this was my first experience with a lost bag. I suppose it was as good as any time to have one, since the bag had mostly dirty clothes and I didn’t immediately need anything in there. It was an incredible week. As expected, I (along with many others) operated on far too little sleep and way too much coffee for the entire time. However, it was well worth the time, travel, and exhaustion to spend time with some of the smartest people on the planet. 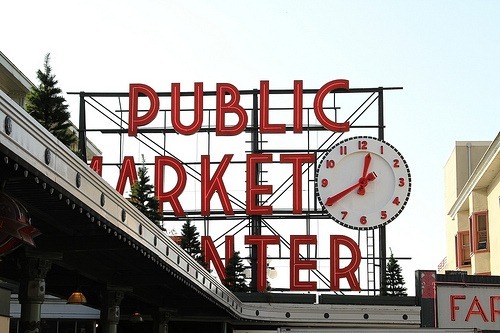 I look forward all year to this trip, and this year’s SQL PASS summit did not disappoint. Update: I have published the photos I took during the week on my Flickr stream. You can find them here. Be the first to comment on "SQL PASS Summit 2012 in Review"